we are dealing in Ion Analyzer. The IROX mid-FTIR analyzer series are the only truly portable and fully automated FTIR fuel quality testers that allow a fast and highly precise analysis of gasoline and diesel fuel directly in the Lab & field. 3048 IRON ANALYZER The Waltron 3048 Iron Analyzer provides you with cutting-edge technology for online measurement of dissolved iron in ultrapure water applications. 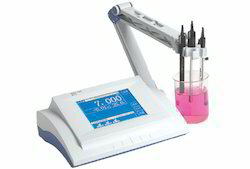 - Direct measurement of pX (activity), pH, ORP, EMF, Concentration and Temperature. - Programmable calibration upto 10 points with Memory Backup. - Analysis - by direct & Incremental (Standard & Analyte addition & subtraction) methods.